Put on your comfy shoes and celebrate spring with an afternoon of dancing that’s perfect for the entire family. 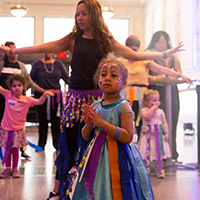 Learn some new moves, get down to your favorite tunes spun by a guest DJ, enjoy interactive performances, and get your creative juices flowing with hands-on activities hosted by community partners. Let’s Move! reminds families that being healthy can be fun, and with this mix of activities and music, you won’t be able to keep still. Made possible with generous support of the McKinney Charitable Foundation through the PNC Charitable Trusts Grants Review Committee, and Highmark Blue Cross Blue Shield.